Skateboarding and snowboarding are two of my favorite sports. Surfing? Not so much, though not for a lack of trying to have a good time riding waves in popular surf spots around the world. Most recently, I've spent the last few weeks hanging out in the small surf town of Montanita, Ecuador. In a beach community where surfing is the primary draw, I received the inevitable inquiries about whether I was planning to surf, or learn to surf. My favorite family vacation was the two week trip to Hawaii we took when I was 13. We stayed in one of the many Waikiki Hotels on Oahu, and it was on Waikiki Beach that I had my first surf lesson. More than 20 years later, I remember the scene and experience like it was yesterday. Beautiful, sunny day. Long white sand beach lined with hotels, and all the way at the end, Diamond Head mountain. 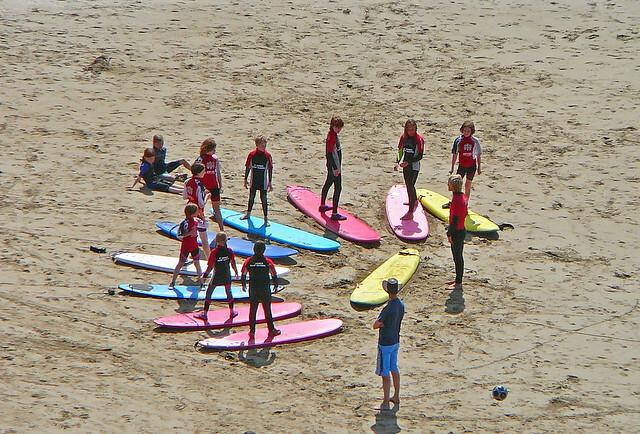 As with most surf beaches, there was no shortage of local instructors happy to offer one hour lessons. I was up and standing on the board by my second or third try, riding a wave toward shore, and hoping I didn't fall and cut myself on what seemed like very shallow water over coral reef. These moments were my best on a surfboard, and any attempt to replicate them as an adult have not ended well. But all was not perfect with the experience. Unfortunately, I thought a white t-shirt was sufficient sun protection, and paid the price with a severely burned back — the pain of which I remember just as vividly as the surfing. If you can manage it, I think Hawaii vacations offer the ideal atmosphere for learning to surf, whatever your age. Fast forward 16 years, and I'm backpacking Costa Rica. The country's Pacific Coast had long been on the surf map, while the rest of the country had become a popular destination for its cloud forests, ziplines, and volcanoes. 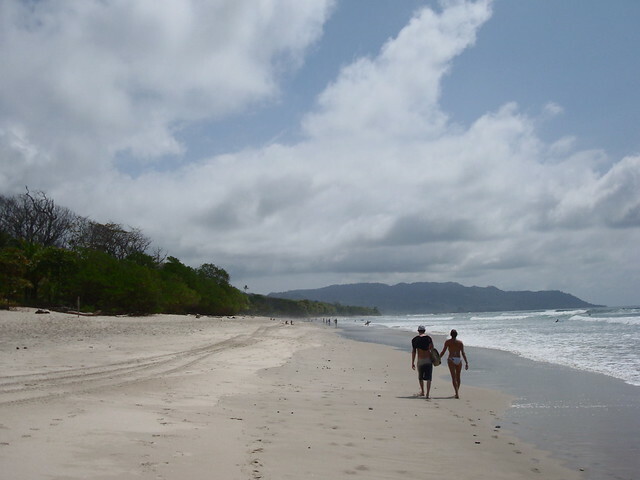 After traveling along the Caribbean coast, and then through La Fortuna and Montaverde, I swung over to the Pacific coast, landing on a beach called Playa Santa Teresa. I got a cheap, beachfront room. Next door, surfers were camped out in tents. Some of them looked as if they'd been there for weeks, or more. I remember one guy was from a landlocked European country. Switzerland maybe? I signed up for a morning lesson from one of the many surf camps, and the next day, proceeded to have a lesson that went fairly well. I got up on my giant, beginner-size board, and managed not to get too terribly sunburned (despite making the same mistake of thinking a t-shirt would somehow protect my back). The morning lesson went so well, I decided to rent a board and go out on my own in the afternoon. Unfortunately, enthusiasm doesn't trump a knowledge of the tides, and I found myself unable to get up on the board in the afternoon. Waves were breaking close to shore, which should've probably set off alarm bells, but I was too focused on trying to catch a wave. After getting battered a few times, I tried to catch a wave, only to find my body being flipped over. Underwater, my eyes opened as I saw my head hit the front of the board, and thereby snapping off the triangular front tip. As I headed up the beach, broken board in hand, an Aussie surfer asked me what happened. After I explained, he suggested the board had already been broken in the same place before, and repaired, which is why it broke again so easily. He said boards don't normally break in the front like that, and that I shouldn't pay for it to be repaired. Back at the surf camp, I presented the broken board, at which point my instructor from the morning lesson apologized…he didn't realize I was going out (at the wrong time of day) when he rented me the board earlier. They said I'd need to pay for the repair, which I did. I was over surfing, and didn't have the energy or confidence to argue. I was lucky I didn't break my neck, and the experience left me with little desire to try surfing again. I held off as long as I could, while traveling the East coast from Byron Bay north toward Cairns, before hearing that the small town of Agnes Waters was the northernmost surf point, and therefore the cheapest place to take a lesson. Excellent. I could squeeze in a lesson so I could claim to have gone surfing in Australia. When I got to Agnes Waters, it was clear I wasn't alone in the desire to save a buck while learning to surf. My group lesson was no less than 15 people. There literally weren't enough boards for everyone in the group, so a few people had to sit on the beach at any given time and watch. The lesson was held at mid-day, from about 11 AM to 1 PM, when the sun was strongest. I imagine this had to do with the tides, but the intense sun didn't make the experience any easier. The waves….for the first time I couldn't get myself up on the board. Not once. I spent all my energy paddling out, ducking under waves, and then being unable to get up on the board. Repeat x10, and I was exhausted. The group size meant a complete lack of personal attention. It'd be the last time I saw any point in taking a surf lesson just because I'm visiting a popular surf beach. My attempts at surfing taught me one thing, respect for the ocean. I'm sure it's an amazing sport once you get the hang of it, if it's anything like snowboarding, but until I'm living on a beach, and can spend weeks, if not months learning, I'm more than happy to sit back, relax, and watch from shore. This was a sponsored post, which enables me to continue bringing you entertaining travel stories and practical travel tips from around the world. Surfing definitely isn’t for everyone but once you get it down it is exhilarating. You might enjoy Stand up Paddling. I feel like it’s more stable / gentle. I’m generally afraid of getting hurt in the ocean and I still do it!